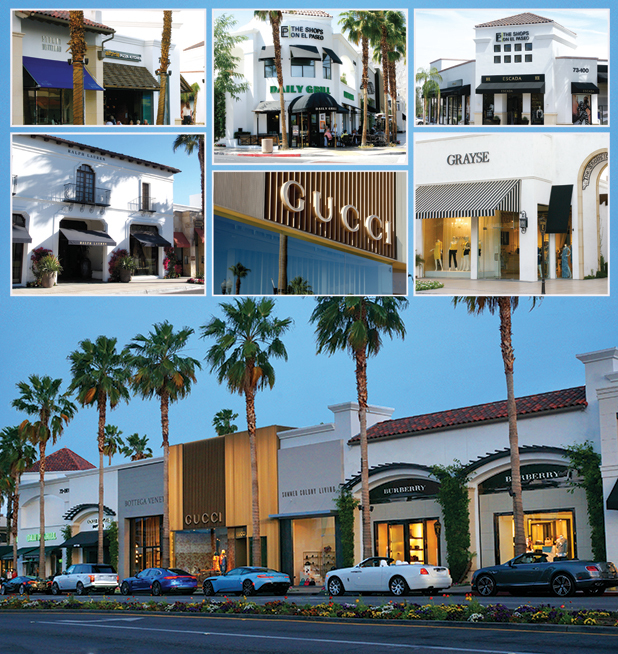 A dynamic collection of renowned designer boutiques and inviting restaurants: St. John, Burberry, Summer Colony Living, Gucci, Bottega Veneta, Oliver Peoples, Daily Grill, Leggiadro, Candice Held, Ralph Lauren, Stuart Weitzman, California Pizza Kitchen, Escada, Soma, Chico's, Riga's, and Grayse. RETAIL HOURS: Mon.–Sat. 10 a.m.–6 p.m., Sun. 11 a.m.–5 p.m.
CALIFORNIA PIZZA KITCHEN: Mon.–Sat. 11 a.m.–10 p.m., Sun. 11 a.m.–9 p.m.
DAILY GRILL: Mon.–Fri. 11 a.m.–10 p.m., Sat.–Sun. 10 a.m.–10 p.m.
Visit theshopsonelpaseo.com for upcoming events and promotions. Complimentary valet parking provided during season.